In any time-based sport there is a difficult balance that has to be struck. A mixture of training and quick times in races must be found that allows athletes to qualify for the big events while still keeping some gas in the tank so that they are hitting peak performance at just the right time. The WolfPack swimming team pulled that off successfully this past weekend as all three swimmers that qualified for the Canada West Championships achieved personal best swims. Greg Petersen, Jagdeesh Uppal and Taylor Carmichael represented TRU extremely well throughout the meet that took place all weekend long in Vancouver. On the first day, Petersen placed 20th in the 50 metre event, posting a time that was 1.2 seconds better than his previous personal best. Uppal, a returning member from the team last year, came 24th in the 50 metre backstroke, touching the wall just under half a second quicker than he ever has before. Carmichael, the lone female competing for the WolfPack, finished the best of all of the ‘Pack swimmers, finishing 14th in the 800 metre freestyle event with a time that was an astonishing 4.2 seconds better than her previous best effort. Those positive results gave the ‘Pack even more confidence heading into the second day of the competition, which again saw some great results for TRU. 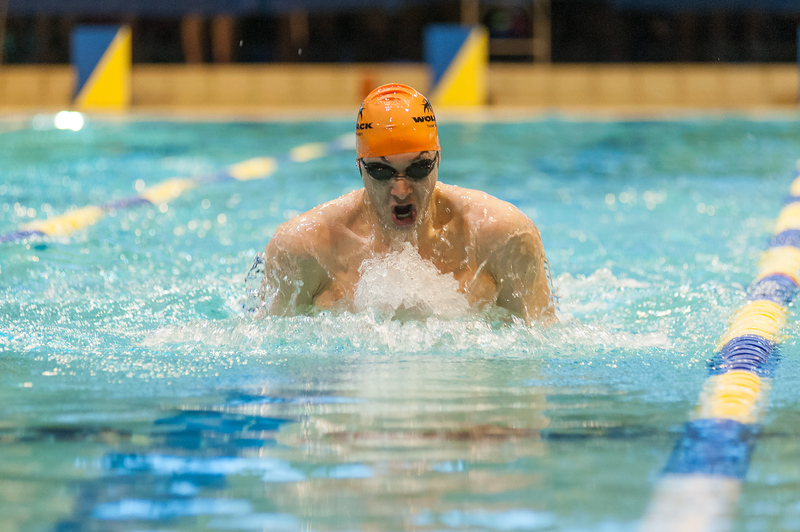 Petersen managed to knock five whole seconds off his personal best time in the 100 metre breaststroke, and just missed posting a time that was good enough to qualify him for CIS nationals. Uppal also had a strong Saturday in the water, finishing 25th in the 100 metre breaststroke. Despite missing out on qualifying for the finals, Carmichael recovered quickly to place fifth in the consolation final of the 200 metre freestyle. The three TRU swimmers qualified for the Canada West championships by posting quick enough times in their in-season meets during 2015. “It’s all about time standards. Basically you have a 12-month time period to qualify, so these kids have accomplished these times to go to this competition anywhere from a year ago at this time in Lethbridge,” said Brad Dalke, swimming team head coach. As Dalke mentioned, last year’s Canada West championships were held in Lethbridge, Alta., a competition that only one TRU swimmer was able to qualify for. In just their second year of existence the TRU swim team has improved greatly to have three swimmers qualify, which Dalke is happy with, but he still thinks there is room to improve. The calibre of competition was extremely high at the championships, with TRU competing against athletes “that are attending Olympic trials, shooting for Olympic teams for sure,” Dalke said. The meet not only crowned the best of the West but also served as a qualifier for the CIS nationals meet that will take place in Quebec City Feb. 25 to 27. Despite the WolfPack athletes setting all those personal best times, none managed to qualify for nationals, though Dalke feels as though they could have been even faster in their home pool.